Anusara yoga is a 13- year yoga with an uplifting tantric philosophy that life is good, actually that nothing exists that is not Shiva-Shakti. We look for the good first in all that is. Yes nicknamed the happy yoga but actually we embrace the whole spectrum of life. Many people actually practice Anusara because it embraces the darkness as well. Anusara is a yoga about pulsation, Spanda. These opposite energies merge to find balance whether it is muscular energy and organic, rooting to rise, or inner and outer spiral. It is balanced energies and in the balance is the freedom. We align with the Supreme Intelligence of the Universe, back with the way nature intended. When we line up in this way, our physical blueprint is optimized and thus so is our prana. Sounds simple right? It is the most natural thing on the planet. The problem is we are so used to being out of alignment that we have to relearn how to do this. We actually forget how free we ultimately are; we are so free that we can choose to misalign and ultimately suffer. The paradox of yoga is that we need to create boundaries to be free. Yoga is not letting go and doing whatever we want and it certainly is not stretching without engaging first. Anusara yoga gives us a template for skillful living, how to align most optimally with the divine energy within us which is our true nature. It teaches us to participate fully, show up fully yet allow ourselves to be breathed, to be danced, to let the shakti move us from the inside out. 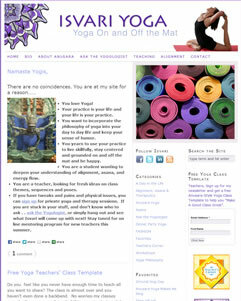 I like the header, images are well positioned and the color of the mats on the sidebar helps draw the eyes into the site.